Life In A House of Blue ! : Oreck Halo - WIN !!!! 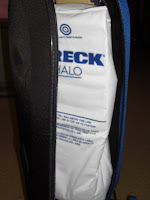 Home > Giveaway, Home, Review > Oreck Halo - WIN !!!! Oreck Halo - WIN !!!! My old vacuum was on its last leg and I was on the search for a new one when I came across the NEW Oreck Halo. The first thing that caught my eye was that it had a UV-C germicidal lig ht. The new Oreck Halo not only vacuums up dirt and debris, it also has a UV-C light chamber that kills many microscopic germs, bacteria, viruses, mold, dust mite eggs, and flea eggs. Your carpet and floors will be clean and nearly free of germs without using any chemicals. My middle son has RAD ( Reactive airway disease) which is along the same lines as asthma. My first thought was "WOW, this might make our home a safer environment for him." So you can imagine how thrilled I was when Oreck sent the new Halo for us to review! When It arrived it was very simple to put together and ready to use in minutes. I thought I was excited about it arriving but to my surprise my husband had to be the first to vacuum with it! compared to 49 bacteria particles found on a household toilet seat. Carpet can contain as many as 100,000 dust mites per square yard. Dust mites are one of the leading causes of indoor allergies, in particular asthma. Check out this before and after video. The Oreck Halo is the only upright vacuum that uses Oreck Halo UV-C Technology to kill many germs that can live and breed on your carpets and hard floor surfaces. It cleans the dirt you see on your floors, and, using Oreck Halo UV-C Technology, it can also kill many of the microscopic dust mite eggs, bacteria, viruses, molds, flea eggs, and other germs you can’t see. It does this all without the use of chemicals, making your life easier because you are vacuuming and killing germs in one step. The Oreck Halo has been independently tested and proven to instantly kill more than 99 percent of germs on surfaces exposed to its UV-C light. It features two high-powered motors: One drives the “brushroll” that fluffs up your carpet’s nap and the other delivers maximum suction and pickup, which means dirt and germs are quickly trapped inside the Oreck Halo’s HEPA 13 filter bag for safe removal. The filter bag uses a fiber that creates a nearly impenetrable wall. It’s so tightly woven that dead germs, bacteria, viruses, allergens and mold stay inside while Oreck’s patented Sani-Seal tab prevents dust and filth from escaping. The Oreck Halo operates like other vacuums, except it uses a highly advanced, patented light chamber on the bottom of the vacuum that controls the heat, amplification and focus of the UV-C light and projects it downward and outward. Switch the vacuum from "Off" to an "On" or "Brushroll On" setting via a switch on the back of the unit’s torso. Press a foot lever to incline the unit’s torso and telescoping handle. 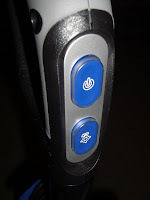 Press a trigger in the handle to activate the UV-C light. A logo on the top of the unit’s base glows to indicate the UV-C light is engaged. Run the vacuum over your carpets as you normally would, killing unseen germs,bacteria, viruses, allergens and mold on all household floor surfaces. If you’re using the Oreck Halo on non-carpeted surfaces, turn off the Brushroll on setting. 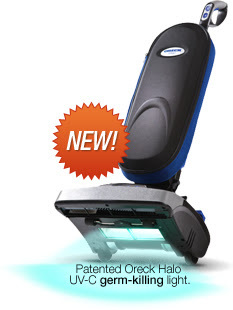 The Oreck Halo glows blue as it kills dust mite eggs, flea eggs, bacteria and other germs. See the Oreck Halo in action !!! 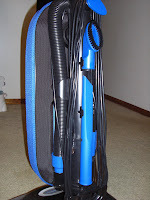 The Oreck Halo also has a hose and brush attachment that can reach 13 feet. These aid in getting into those hard to reach places. It has a powerful suction that had my sofa and chairs clean in no time ! I was surprised with the following video when comparing a canister vacuum (like my old one) to the Oreck Halo. Every time I use this vacuum it gives me a good feeling as a Mom know I am doing something that is GREAT for my family's health. I like that is is not an extra step to my cleaning routine but just a change to the tool I use to do it with ! I was worried about going from a canister to a bag vacuum. I was worried if it would cost me an arm and leg for bags and that they would be hard to find. To my surprise the answer to both questions was NO !!! I purchased a pack of 8 bags for the Oreck Halo at a local Oreck dealer for right under $30. I think that is a great deal and very convenient to buy. If you do not have a local Oreck Dealer near you , they can also be purchased online. The Oreck Halo kills E.coli. It kills bacteria, viruses and mold! I feel better and healthier all ready. Wowza! One of the microorganisms that the Oreck Halo kills with its UV-C light Dust Mite Eggs and E. Coli. 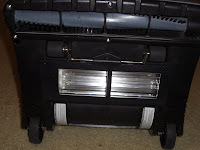 It is so amazing to me that all this can be done just by vacuuming as you normally would, and let this genius UV-C light do the work! With 3 young children and 2 dogs we truly need this in our home. Living on the lake everything gets moldy and dusty fast so this vacuum is my idea of a dream machine! Thanks so much for the chance to enter. I Visited The Mom Buzz and entered Erin's Oreck Halo Contest. Ew, dust mites... the halo oreck can help reduce their populations. Ew, I don't even want to think about it. It kills Hepatitis! This is an impressive vacuum! It kills dust mite eggs and mold (which I am very allergic to). Thanks! Great product. The Oreck kills E-coli! Very nice. I would love one of these! It kills dust mite eggs. Love this! Thank you so much! I'm a twitter follower and tweeted about your giveaway. thanks. I entered the giveaway at The Mom Buzz. Entered contest on The Mom Buzz. I entered at The Mom Buzz! One of the microorganisms that the Oreck Halo kills is Hepatitis. Entered at the Mom Buzz. one of the microorganisms that the Oreck Halo kills with its UV-C light is e-coli...ewl! It kills dust mite eggs, flea eggs, and viruses. The Oreck Halo kills E Coli. Thanks. Gets rid of dust mites. The UV-C Light kills bacteria, viruses, and mold. We have a lot of bacteria, I think, because I have a three-year-old, a two-year-old, and a one-year-old, and they are always dropping food particles everywhere (which then decay), and they are little germ factories themselves since they track in a lot of stuff from outdoors. It kills flea eggs which is what would help in my house!! It kills mold, and ecoli--I want this vacuum. I entered the Halo contest on The Mom Buzz. ecoli- yuck! I need one of these badly! We have a cheapo from walmart! Dust mite eggs is one of the many microorganisms that the Oreck Halo kills. I would love to own one. Thanks for the chance! I entered the contest at the Mom Buzz. I entered Erin's Oreck giveaway. It kills dust mite eggs. Thanks! This kills dust mites, that is awesome. I subscribe via e-mail. Thanks! I entered the giveaway at Mom Buzz. I entered at The Mom Buzz. The Oreck kills e.coli & mold! It kills E-coli in less than a second! I entered Erin's Oreck Halo Contest. I'm a fan of Life In A House Of Blue on Facebook. As a person with allergies this vacuum would be awesome...The UV light kills Dust mite eggs, flea eggs, mold, bacteria, germs, and other microorganisms, and since I am allergic to most of these microorganisms..I think I would love this vacuum! I learned that this vacuum does better than steam cleaners because it doesn't need to use water. The Oreck Halo kills mold, plus several other things! I love its flea-killing power and that UV-C light. sierramuse8 at aol dot com. Kills e-coli which is great! don't want that on my floors. The light kills e.coli. And to think, the current vacuum I have doesn't even remove the stuff I can see! Oh man - I really need a new vacuum. I have an older Oreck now, but it doesn't have the hose attachment which I really need. It kills Mold. Bacteria and mold. I also entered on The Mom Buzz. One of the microorganisms that the Oreck Halo kills with its UV-C light is dust mite eggs. YUCK! I entered at Mom Buzz! i cant believe it kills polio! how do they even khnow that? thats awsome. my little got this when she was 15 months old a was hospitalized for a week. horrible horrible germs.